Brickhouse Environmental obtained an Act 2 Release of Cleanup Liability for soil as a result of a heating oil spill in the home’s basement. A steel 275 gallon aboveground heating oil tank (AST) burst during a delivery of heating oil. The AST was located on a poured concrete floor in the basement of the residence. An estimate 235± gallons of heating oil was released to the basement floor. Product penetrated a portion of the concrete block wall adjoining the AST, and seeped into the underlying soil beneath the floor and foundation of the home via the expansion joint between the floor and the wall. The horizontal and vertical extent of the impacted soil was investigated through a soil boring program. Heating oil compounds exceeding Statewide Health Standards extended to depth of up to 6 feet below the basement floor. Groundwater was sampled via temporary well points and by sampling the existing water supply well. Impacts to groundwater were not identified. 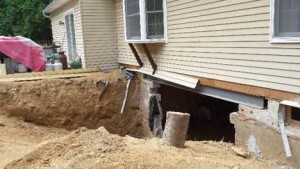 Since soil impacts were focused beneath the foundation, structural engineers were brought into the team to develop a plan for removing the soil while maintaining the structural integrity of the home. 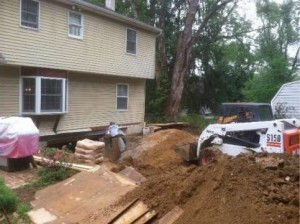 Remedial actions were completed in a step wise fashion along with pouring concrete foundational supports and steel beams to support the two story home, as basement walls were removed to allow for excavation. A total of 160 tons of soil was removed for proper disposal. Remediation and site restoration was completed over a period of 7 weeks. Demonstration of Attainment samples were collected to confirm that all impacted soil was removed. Indoor air samples collected following completion of the remediation met indoor air quality standards. The Final Act 2 report supporting demonstration of attainment under the residential Statewide Health Standard was approved by the PADEP in 2015. All parties involved in the remediation project were pleased with the project work and thanked Brickhouse for their swift actions.